Improving speed, agility, and quickness is a priority for many ultimate players. After all, it’s an explosive sport full of sprinting and jumping. 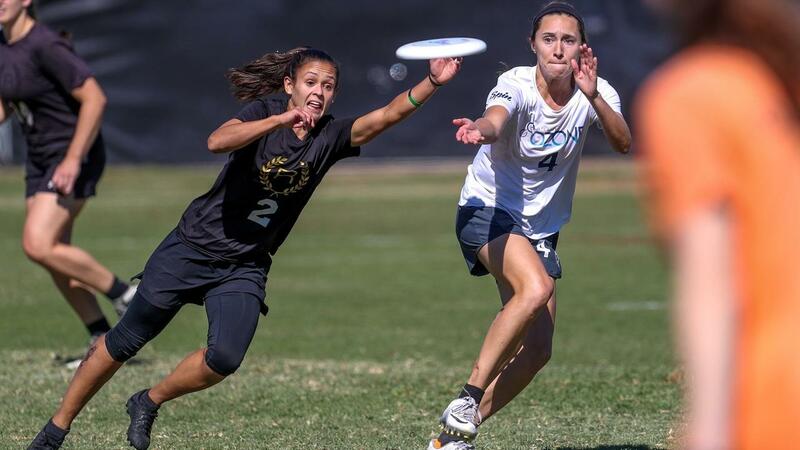 What better demonstration than Olivia Arellano's amazing defensive effort in Ultiworld’s Block of the Year competition? Among the contenders for the coveted prize were Ultimate Skills Project coach John McNaughton and a certain Jonah Wisch, who was unlucky to meet John in the first round, before McNaughton himself fell to eventual runner-up Von Alanguilan. Want to learn how to make plays like that? Lucky for you, Jonah’s written up a practical guide to improving these key attributes based on the science behind effective strength training. Read on and enjoy! There’s a common misconception among parents, coaches, and athletes on how to train for speed, quickness, agility, and jumping ability. Repetitive sprints, cone drills, and speed ladder work are the norm, but they are not the most effective at getting results. If this were the case, athletes would get faster and quicker simply by playing their sport; sprinting, cutting, and changing direction take place in every match! Ways to improve these athletic traits include increased force production and rate of force development (these are not the same but can be trained simultaneously), proper body positioning (ex. sprinting/jumping technique), and body composition improvements. Some athletes are genetically gifted with a better ratio of fast-twitch to slow-twitch fibers, but there are still many important steps that one can take to improve speed of movement in sport. Athletes can improve their efficiency by addressing mobility, stability and muscular activation patterns. What are the Common Problems? Athletes develop and reinforce improper movement mechanics due to several different variables. Previous injuries, compensation or poor activation patterns, repetitive asymmetrical movements or loads, poor movement self-awareness, and lack of exposure to qualified coaching will all contribute to an athlete putting themselves at risk for an acute or overuse injury by developing movement dysfunctions. Addressing inefficiencies in an athlete’s mechanics consists of several steps. Sometimes an athlete just needs a little bit of coaching to improve their technique. If they were never taught to lift or move with proper form, they may not be familiar with correct body positioning while executing an exercise or drill. Guidance here can solve some issues, but if not, further action is needed. The first goal with any athlete as they begin a program is to address any mobility issues. These issues can be the effect of soft tissue restrictions, joint restrictions, or poor activation patterns. As an athlete improves their mobility, we must then address their ability to stabilize through a greater range of motion. If an athlete is mobile, but not stable, you encounter what we call energy leaks. If your body is in an unstable position you will find it difficult to utilize the amount of force you’re able to produce by your larger muscle groups. Improving mobility/stability will only go so far if an athlete has poor mechanics. Whether it’s teaching lateral, linear, jumping, or rotational mechanics, an athlete needs to feel and understand the body positioning that will lead to optimal performance and sport transfer. Poor activation patterns can develop through repetitive stress and bad postural habits. Teaching the targeted muscle groups to fire and opposing muscle groups to relax can help improve force production as well as force transfer through the body. Put simply, developing strength will help increase the amount of force one can produce. Strength training is typically the solution. Improving an athlete’s strength/body weight ratio in most cases will make the biggest difference in development of speed or jumping ability if mechanics are sound. Exercise selection is important. The exercises incorporated into a program must fit the level and needs of the individual. Proper progressions are the key to growth and development. In order to prevent injuries in the weight room, it is important to design a program according to your athlete’s needs. If a lift doesn’t have any functional carryover to the sport, it’s not going to benefit an athlete. All sports are different, but all athletes need to increase efficiency, strength, power, and speed. Force development is the rate at which you can apply the force you’ve built up with strength training. There are a number of stages to achieving this. Strength, speed, and power performance rely heavily on the nervous system. Normally a person would classify muscularity or definition with strength or power, but this is not always the case. Our body’s ability to excite a high percentage of muscle fibers at once for a given task plays a large role in determining the speed of movement. This is the first progression to any power/plyometric exercise or drill. In order to apply force, you must first be able to feel, understand, and be comfortable in the position you are attempting to attain during performance. Almost any drill can be regressed to target acceleration or starting strength. You must implement plyometric training to increase rate of force development and elasticity. The key to plyometric training is progressing safely, and that the intensity in terms of effort is high. We must train fast to be fast. Olympic lifts, when utilized correctly, can be one of the most beneficial lifts in athletic performance. All serious athletes should slowly progress into Olympic lifting, though in reality, some of them may never make it there. Some athletes will substitute other power exercises (ex. squat jumps, resisted sprints, kettlebell swings) in place of Olympic lifts due to previous injuries or learning time constraints. This is the ratio of lean mass to fat mass. Any extra mass that does not play a role in creating or transferring force will hinder an athlete’s speed of movement. While certain sports require additional mass to help protect the body from impact or injury, ultimate success doesn’t rely on such mass, and as such, players will benefit by maintaining a low body-fat percentage. In addition, hypertrophy training that doesn’t lead to overall strength or performance gains—increasing muscle mass without improvements in performance—has no place in an athletic training program. Diet plays a major role in maintaining a lean, athletic body composition. When in doubt, it is always easiest to choose real food to supplement your athletic goals. Lean meats and fish, leafy greens and vegetables, tree nuts, fruits, and a minimal amount of sugar (except possibly around competition or an intense training session) will work for most athletes. A gram of protein per pound of bodyweight is an easy rule of thumb to follow, as is a large handful or two of vegetables with each meal. Supplements like fish oil and daily multivitamins can also help. Jonah has a rare mix of playing, coaching, and sports performance coaching in the ultimate community. He played for Pitt Men's Ultimate from 2014-2018, captained the USA U-24 Men's National Team in Perth in 2018, has coached at 15+ youth summer ultimate camps, and wrote a book titled, "In Your Own Hands: A Guidebook to Physical Development for College Ultimate Players". You can access the book online here. Want to take your own game to an explosive new level? Sign up to our mailing list and get our 6 Week SAQ Plan free! You'll be making plays like Arellano in no time!